Building 3 is the home of the Learning Commons - a collaborative space providing student-centered support in the areas of Math, Language, Writing, Career Counselling, IT, and Information & Research. Students receive tutoring and assistance in an open-concept, dynamic and welcoming environment promoting group study, collaboration and use of the latest technologies. The Commons is equipped with computer workstations, group study rooms with plasma screens, and laptops for loan. An open IT Lab and specialized learning and research computer stations with scanners and adaptive learning technologies provide students with a supportive workspace. 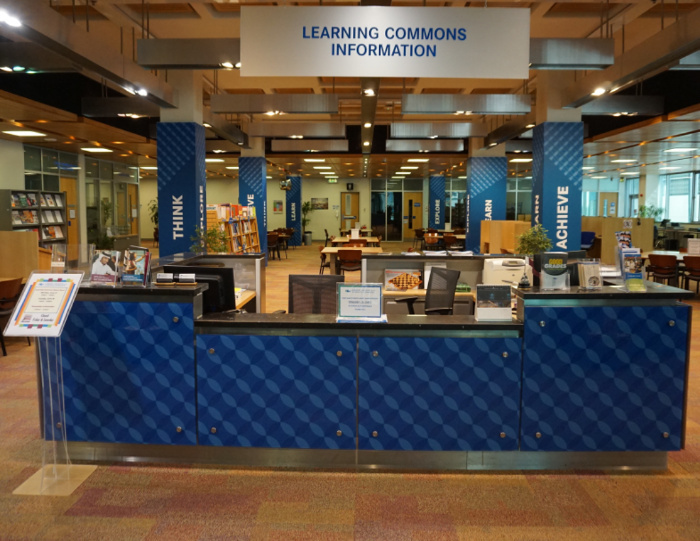 Library services provided in the Learning Commons include a collection of print and journal material to support academic foundation skills, independent learning and recreational reading. With dedicated research stations, the Commons is also the premier site for the College's Virtual Library - the online collection of specialized research databases, e-books and Internet resources. The AWC provides individual or small-group mentoring sessions to discuss and assist students with their writing needs. It chiefly focuses on the writing needs of students who are registered in diploma programs. It helps students with the organization and writing of projects, presentations and assignments. Appointments are normally for one-half hour. Students are advised to make appointments in advance by using The AWC Online Appointment Calendar. The Advanced Writing Center D2L page also provides online access to writing resources such as grammar and APA tipsheets. No appointment is necessary – some students come in for just one quick question and others stay for an hour or longer. Please bring your questions, class notes and your calculator. Here students can find out about careers, complete aptitude tests, research degree program options, get help with resumes and interviews and, through the available literature, learn more about career choices, interest inventories, universities, etc. The CCRC also offers student employment services for part-time, on-campus positions. Hours: Closed for the semester. Students can ask their instructors for help, and can also find practice materials on our intranet (link only works from computers on campus). This multi-purpose area promotes independent learning and provides services for students who would like assistance with classroom English skills and projects, reports, presentations or other difficult subjects. It focuses mainly on students who have not yet entered specific program courses. Students go here for assistance with all their IT concerns from setting up individual accounts, resetting passwords, connecting to the wireless network, to any individual issues. The library provides information and reference services to students in need of research help, and a collection of recreational reading resources (magazines, newspapers, novels) and books in the areas of career planning, math help, English language skills assistance and student study skills (time management, reading, writing and presentation help). The Learning Commons’ Digital Media Centre is a workspace where you can collaborate, learn new skills and experiment using a range of multi-media tools. This Centre offers 5 workstations: 4 of these have audio, video and graphics editing software, while the 5th one offers you a green screen for creating a unique background for your presentation or video assignment. Visit us and get creative!